If you love running, you probably try not to let anything stand between you and your regular constitutional. Some of the most avid runners will run in every condition imaginable: rain, sleet, snow, fog, the dead heat of Summer. For many it really doesn't matter what's going on in the outdoors, they MUST get their run in. If so, there are some safety precautions you should be taking before you head out for your run if you live in a part of the world that is prone to VERY cold winters. You could be setting yourself up for unneeded discomfort or even injury by hitting the trail unprepared. The most important thing to cover is yourself! 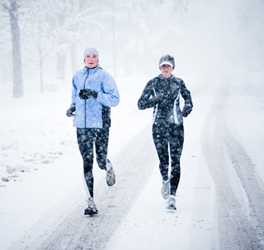 Make sure you have proper weather specific running clothes on. Get some good technical gear that will wick the sweat away from your skin so that when you stop running your sweat doesn't start freezing to your skin. It's also a very good idea to dress in many layers. Chances are once you start moving you will feel warmer ... and maybe even too hot with the amount of clothing on that is required to keep you warm when you're not in motion. So make sure you've dressed in layers you can strip off as you warm up. But also make sure these garments are something you can tie to yourself in some way so you aren't stuck carrying them in your hands while they're not needed. Then you'll have your clothing with you when you stop running and need to start layering your clothing back on for warmth. Always cover your head for warmth. More heat is lost through your scalp that you might realize. And, you may not feel it until it's too late, but your ears are very susceptible to frostbite so make sure you keep those covered in extreme climates. If you wear gloves but you find that your fingers still get a bit numb by the end of your run, then either wear mittens (keeping all your fingers together will help them keep each other warm) or slip in some of those one-use glove warmers to help keep your fingers from getting frostbitten. While you're out running in the frigid air, try breathing in through your nose to warm the air before it hits your lungs. Feel free to breathe out through your mouth if you are working hard but breathing in through your mouth may cause pain if the air is super-frigid. You can also wear a covering over your mouth and nose to help warm the air (and protect your face from the climate) but be aware that once you start breathing through the covering, it will likely become pretty wet pretty fast from the condensation in your breath. So if you don't want a cold soggy piece of material stuck to your face it might be better to forego that particular piece of protection or find one made from technical material designed for this use (and even better if it has a mouth hole). Always be sure to wear footwear appropriate to your terrain. Is the ground frozen? Or snowy? Or both? 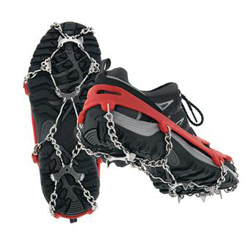 Get yourself a good pair of snow running shoes with proper grips, to prevent slips and slides and potential injury. Take safety up one more notch and invest in some 'tie on' grips for your shoes, specially designed to grip into the snow and ice. Most important of all is to make sure you bring a mode of communication with you, just in case you do slip and sustain an injury. No sense lying out there in the cold freezing to death when a simple small cel phone could have saved your life, right? Make room for one in one of your pockets. You might wind up feeling very glad that you did. Now get out there and have a great, fun, safe and warm run. Sometimes you just CAN'T get outdoors. There will ALWAYS be those days when Mother Nature is just too angry and is kicking up a major fuss out there. Gale force winds ... blizzards ... extreme heat ... extreme bitter cold! It happens. THEN what do you do? You get "Hot at Home", that's what!! Get lots of great, effective fat-burning outdoor AND indoor cardio workouts in ”Hot at Home”. It’s the Transformation Solution for People Who Hate The Gym (like I do). If you want to get in YOUR cardio training session, REGARDLESS of the weather, without being forced to go to a gym just to wait in line to get on their equipment that has a restricted time-limit anyway, then you should get ”Hot at Home”. I show you LOTS of fun and effective ways to burn fat with cardio training and you don’t need ANY equipment. Heck, you don’t even need to leave your house. Why put up with the inconvenient, time-wasting commutes, never-ending membership fees and crazy crowds at the gym when you can get ”Hot at Home” instead? So, scrap that expensive gym membership completely and get in GREAT SHAPE right in the privacy of your own HOME !